Ceiling fans are great for everything from staying cool to improving air circulation. If you’re in the market for them, there are several important factors to consider, including size and budget. Kentucky Lighting & Supply of Lexington is here with your buyer’s guide to ceiling fans. They provide more information on the how to make the best choice. Ceiling fans must be over seven feet off of the floor, according to the National Electric Code. To determine the mount type and downrod length you need, measure the distance from the floor to the ceiling. When it comes to blade span, find out the square footage of the room. For example, rooms of 80 square feet or less will require blade spans of at least 24 inches, while 300 square-foot rooms will need a minimum of 62 inches. Ceiling fans are usually divided into two location groups: indoor and outdoor. For indoor fans, it is best to choose UL Dry-rated products composed of premium wood, which are available in various classic and contemporary designs. For outdoor fans, assess how much moisture the area receives. If you anticipate direct rainfall, you’ll need a UL Wet-rated fan; for moderate humidity, a UL damp-rated fan will work fine. 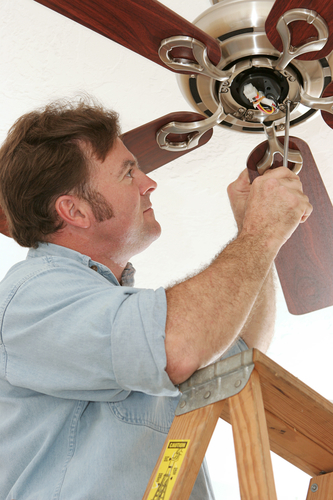 Lastly, set a comfortable budget before purchasing your new ceiling fans. Decide how many fans you will need total, and what size and type they should be. Compare price points in your area, and keep an eye out for special deals. Remember, too, that you’ll have to pay additional fees for installation services, so include these as part of your overall budget. Ceiling fans can be a stylish addition to the home that also increases your comfort. From ceiling fans to lamps and lighting, head on down to Kentucky Lighting & Supply when you want to keep your house ventilated and illuminated. Give them a call at (859) 259-0466 today to speak with a representative about investing in lighting solutions. Visit them online to learn more about their products and services.